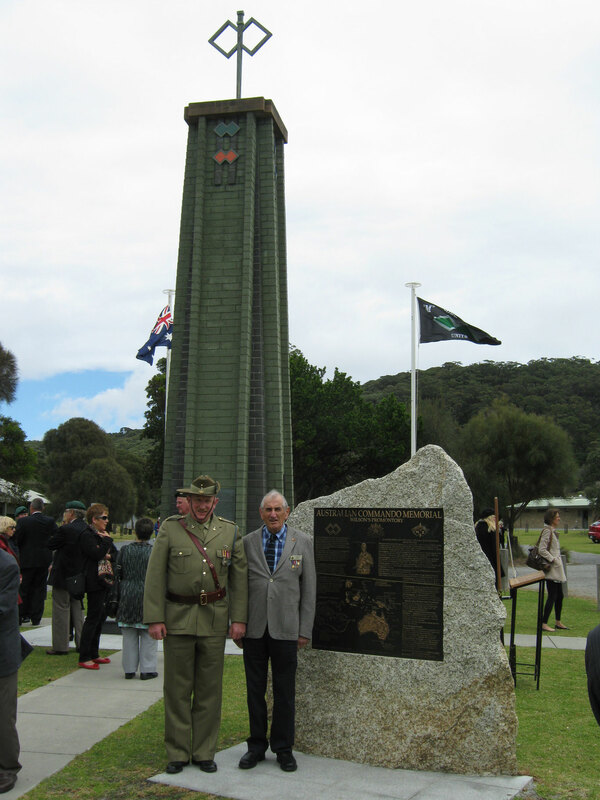 This year’s annual service by the Commando Association marked the 50th anniversary of the dedication of the Australian Commando Memorial at Tidal River. Erected under the auspices of the Commando Association (Victoria) by Australian commandos, the memorial at Wilson’s Promontory commemorates the birthplace of the commando in Australia, and the memory of all the commandos who made the supreme sacrifice in World War II. It was dedicated on 16 November 1964 by the then Lieutenant Governor of Victoria Lieutenant General Sir Edmund Herring. The restored Memorial was re-dedicated by the Premier of Victoria, John Brumby, on 18 November 2007. Architect for the Memorial, Heritage Council of Victoria member, Architect Max Chester OAM was a special guest at the anniversary Memorial pilgrimage at the invitation of Association President (Mr Marc Preston). Some 250 people were present, with a strong contingent of former commandos and their families. A number of senior service personnel attended including Captain Guy Warnock XO of No. 2 Company. The blessing was recited by the Chaplin Ralph Estherby No. 1 CDO Regiment. Many men gave and still give the extreme sacrifice as commandos, said Max, noting on the the Memorial Plaque, a recent death of a VC winner in Afghanistan. A special army bus was provided by the Army to bring the many visitors to Tidal River, from Melbourne, and regional towns along the way.